Last week I was invited to join an Azure Architects Onboarding Bootcamp, near the head-office of Microsoft in downtown Bellevue. This bootcamp, which in earlier times was limited to Microsoft internal staff, was opened up for a select number of Microsoft Partners. There were a large number of pre-requisites you were required to have before you could join the fun. Some pre-requisites were certifications (2 out of 3 Azure exams taken) other were questions about experience with services on the platform. This 5-day bootcamp focused on the incredible wealth of services customers can take advantage of when they decide to embark on a journey into Microsofts’ public cloud. Content was presented mainly by Microsoft product teams. All product teams could have presented their topic for an entire day (or more), but were limited to 1 or 2 hour sessions. Since I did sign yet another Non-Disclosure Agreement (NDA) with Microsoft, I can’t reveal any of the content which was presented. 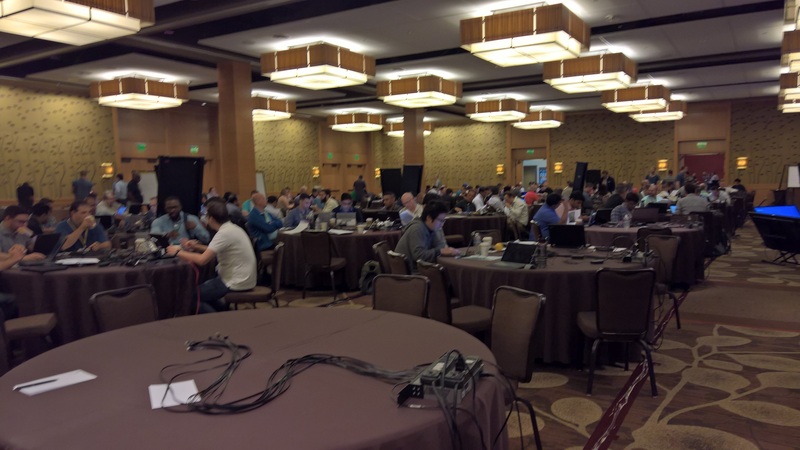 Location of this great event were the meeting rooms in the Hyatt Regency Hotel in Bellevue. Throughout the week we were free of internet outages, which can be a struggle when a conference with a lot of connectivity-savvy people hit your location at a single time. All sessions were introduced by Eduardo Kassner, a very passionate Director of Solutions Architecture at Microsoft. He basically hosted the entire week, engaging with all (Microsoft and non-Microsoft) attendees throughout the week. In this 5-day course we were bombarded with knowledge straight from the source, with a program starting in the morning at 8AM, relentless ending at 7PM. After the last session the organization created more opportunities to interact with each other and vendors with reception, an Expo and a visit to the company store. During the workshops we were challenged with customer cases which needed to be solved. With the people on your table (which changed from day to day) you needed to work on a solution and present that to the “customer” in a 15 minute presentation. Since the attendees had backgrounds in a wide variety of Azure technologies, we were able to come up with a solid solutions in most cases. When you weren’t that familiar with the concerning technology, this way of learning almost forced you to do research and therefore helping you in understanding the service on the Azure platform even better. For me personally it has been a great experience and it has given me unique insights and contacts within the Azure community and platform. The next sessions are planned for October 2016 and February 2017 and when you get the sessions, I’d advise you to attend. You will not get your information from any source closer than this!